This novel is not, yet, available in the shops. One of my pictures is used as cover art and I received a courtesy ‘proof copy’. 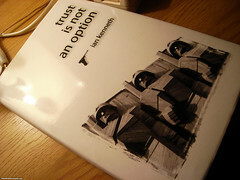 ‘Trust is not an option’ isn’t great, but it’s not bad either. It’s a crime novel and I’m not too keen on them, but this one is as good as many and has a decent twist near the end, even though I felt it coming. Several aspects of the story feel like they still need to be roughed out. Ian Kenneth has a rather strange attention to details which are, most often, left unsaid; things like the brand of laptop used by the lead character or the exact year in which a particular business transaction took place, without them adding value. The second half of the novel was easier to read, as if the author was starting to get the hang of it, writing in a less passive, more attractive style. Also, during the first half, I had the feeling, on several occasions, that the author was trying to show off his knowledge of the international locations that feature in the book. His early inexperience as a writer also shows in awkward jumps in time within one paragraph. Kenneth’s tendency for factual descriptions of locations or persons gives the story a bit of a shallow feel, but at the same time also makes it very real, very gritty, maybe even in-your-face. And there’s a few hiccups with the story line: What’s with John’s fascination with his dead father? And why is he so emotional when he doesn’t get exactly what he wants, professionally (a 10 percent raise isn’t enough)? And why is Robert so obsessed with the probable death of his employer, a man he hardly knew? And Claudia’s fidelity (or lack thereof) is a tad too obvious. If Kenneth is able to take out the rough edges, this could be quite a decent, if not good, novel. The novel taking place in slightly obscure European locations like Sitges and Varna gives it a feel of an old fashioned spy novel. The tale could also work as the script for a thriller. Next: Next post: The impossibility of fighting SpamCop?